Summer is almost here and that means it is time for lots of outdoor family fun and barbecues. 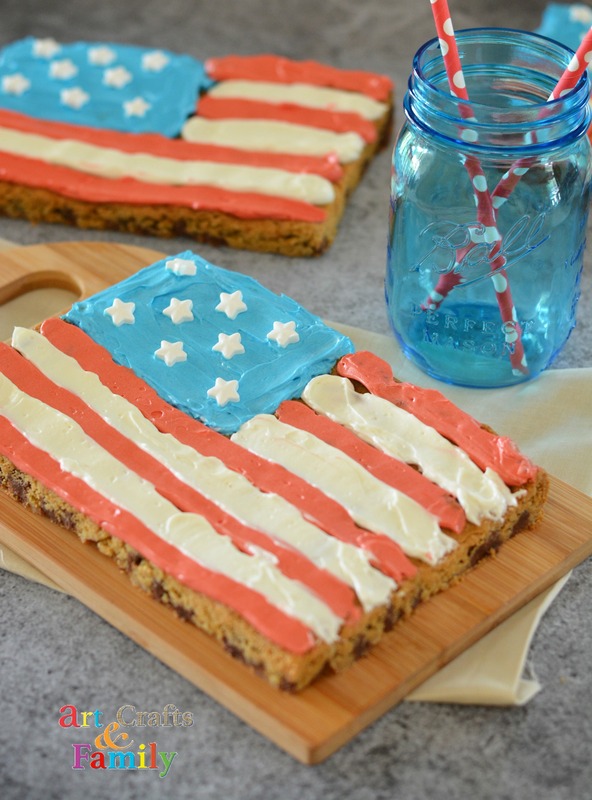 Make these American Flag Cookies for your summer get togethers and be the hit of the party! First prepare and bake a pan of Nestle Toll House Chocolate Chip Cookies using the Pan Cookie Variation. I found that recipe here. Omit nuts if desired. Let cool completely. 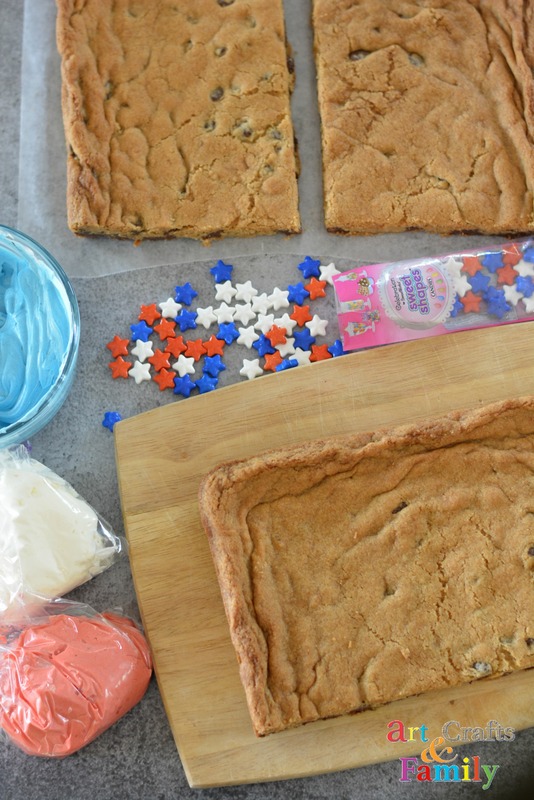 While the pan cookies are cooling, make the buttercream frosting. In a small pan on the stove, whisk the egg whites and white sugar together over medium heat. Whisk constantly until you can't feel any sugar granules. Mine took about 2 minutes. Pour into a mixing bowl and whip until it turns white and doubles in size. Again, about two minutes. Add vanilla and whip until combined. Add butter and powdered sugar and whip. And whip. And whip. This process can take 15-20 minutes on a medium to high speed. At first it will look like it's working, then not working and finally working again. Hold tight and be patient and whip! Evenly divide frosting into thirds. Place one third white frosting into a ziploc bag. In a bowl, color the remaining frosting blue and red. I used Wilton Gel colors in Sky Blue Color and No Taste Red. Leave the blue in a bowl and place the red in a ziplock bag. 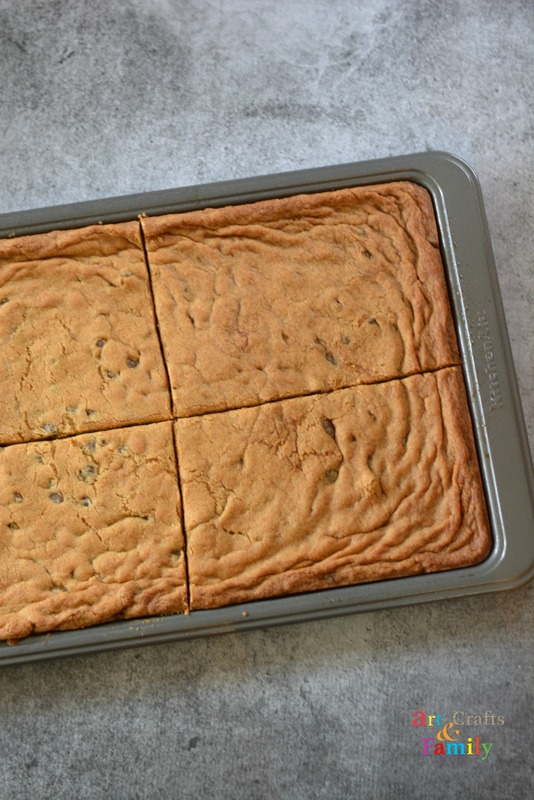 Go back to your cooled cookies and cut the cookies into four large bars as shown. Remove one bar from the plan and place onto a cutting board. Begin to frost your cookies. 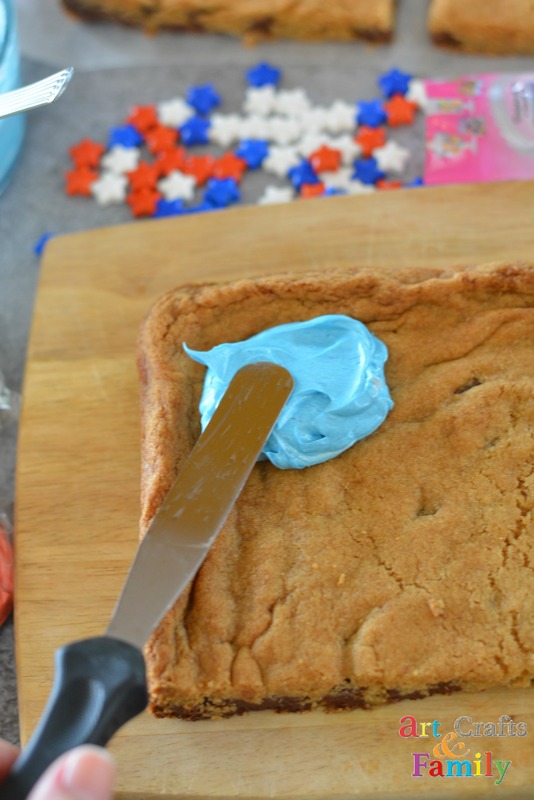 Place a spoonful of blue in the upper left corner and spread evenly with a knife. You may need two spoons of frosting to fill this area. 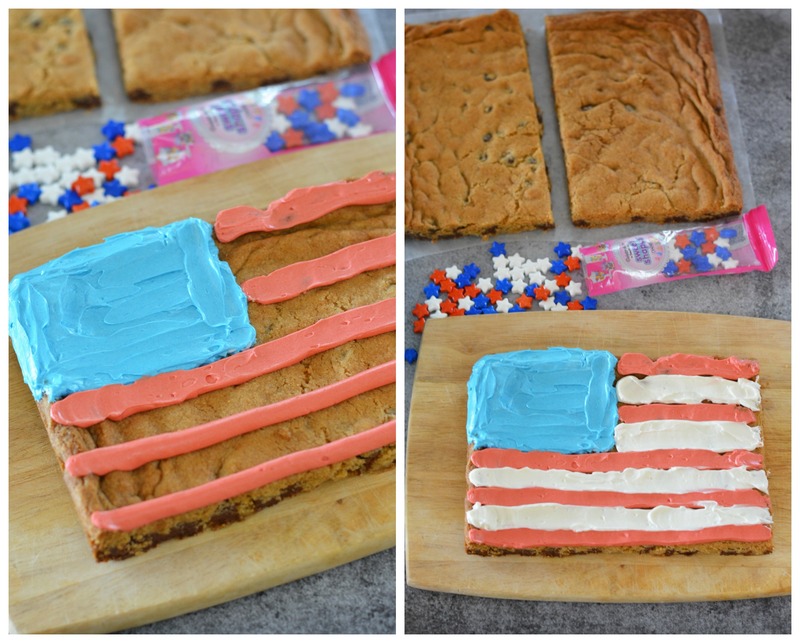 Cut the tip of the red and white ziplock bag and pipe the red stripes on to the cookie. Smooth out with a knife. Add white and smooth as well. 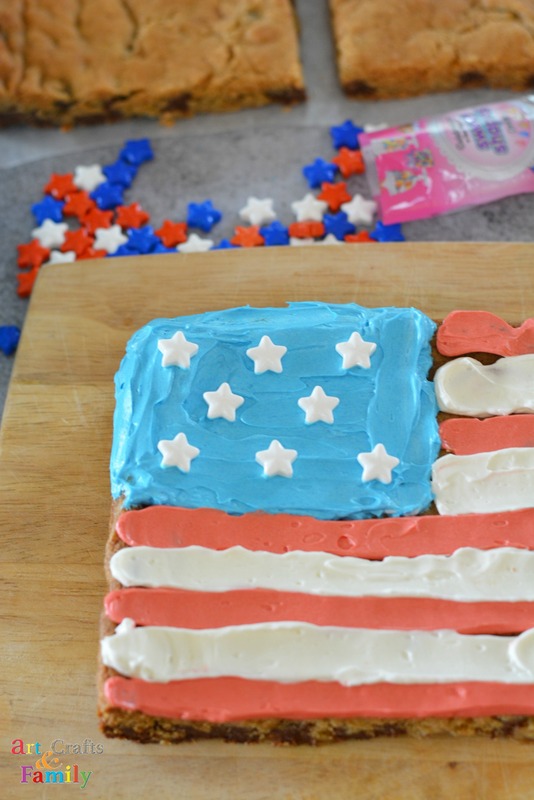 Add candy stars to the blue part of the icing. Repeat on other four cookies. 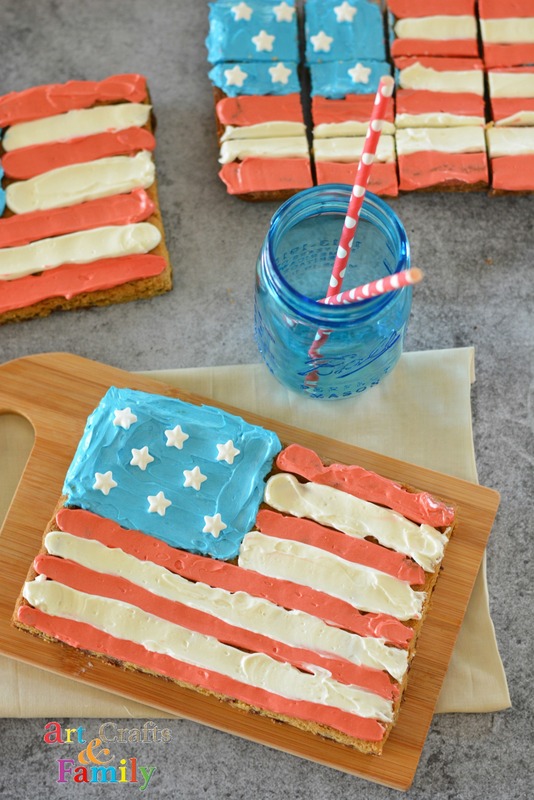 It’s best to refrigerate before cutting so the icing firms up. Cut into 48 bars (each large rectangle yields 12 bars) I’d store in the refrigerator in an airtight container before serving.